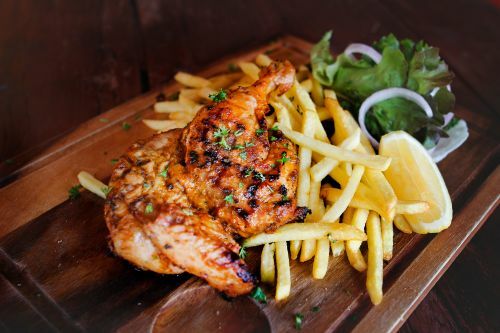 Menulog delivers for Highgate Chicken & Seafood so you'll be able to track your courier on a map. Includes one half chicken, chips, a small salad (potato, coleslaw or pasta) and a 375ml can of soft drink. Includes a large chicken, small chips and your choice of large salad. Includes a large chicken, medium chips, a large salad of your choice and a large gravy. Includes a large chicken, large chips, large gravy and your choice of extra large salad. One piece of butterfish, chips and a 375ml can of drink. One piece of butterfish, four calamari, chips, a salad of your choice and tartar sauce. Three pieces of butterfish, six calamari, chips, a salad of your choice and tartar sauce. Four pieces of butterfish, eight calamari, eight prawns, large chips, a large salad of your choice and tartar sauce. With cheese, bacon, onion, tomato sauce and mustard. Served with chips and a 375ml can of drink. With tomato, lettuce and mayonnaise. Served with chips and a 375ml can of drink. One quarter chicken, chips, mashed potato, peas, gravy and a 375ml can of soft drink. One half chicken, chips, mashed potato, peas, gravy and a 375ml can of soft drink. Chicken schnitzel, chips, mashed potato, peas, gravy and a 375ml can of soft drink. Beef schnitzel, chips, mashed potato, peas, gravy and a 375ml can of soft drink. One quarter chicken, chips, your choice of two salads and a 375ml can of soft drink. One half chicken, chips, two salads of your choice and a 375ml can of soft drink. Chicken schnitzel, chips, two salads of your choice and a 375ml can of soft drink. Beef schnitzel, chips, two salads of your choice and a 375ml can of soft drink.